Well, I managed to get this buttonhole demo done. I felt like a thief sneaking off into my knitting room late at night. That is why the pictures appear dark. I love this finished buttonhole by Thelma Viers. It was in one of her patterns that I bought years ago and have used it ever since. It seems complicated but it isn’t. 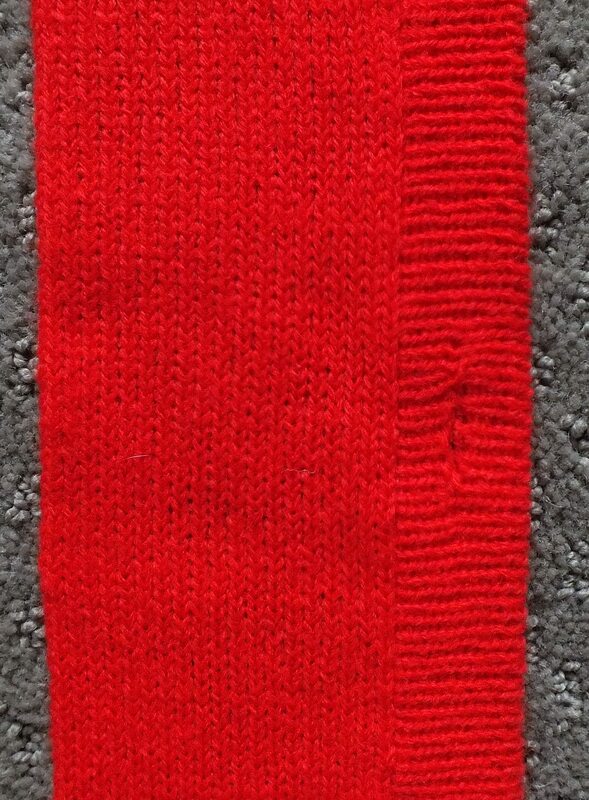 It is just a matter of knitting up to the buttonhole, working on the buttonhole , and then knitting the rest of the way to the left to complete one row. I wrote up instructions that I hope you can follow. I also have 22 pictures in detail in case you get stuck. I do hope you will try this band just making one buttonhole. Once you can knit this , you can try a sample of two buttonholes and then move on to doing a whole band. I made this buttonhole on the Brother Standard Machine. It can be done on the Bulky too. I am sure it can be done on the Passap using setting so certain needles don’t knit. Hmm…am I up for the challenge? Here is the link to my dropbox for all of the pictures and instructions. Please let me know if anyone makes this and likes it as much as I do. If something is not clear to you with my pictures and directions, please email me. If you double click on the first picture in the upper left in the drop box it will become screen size and you will see it will go through the pictures from number 1 to number 22. Andrea asked if I would post how I crossed the cables that were in the buttonhole bands. Here is the link to see pictures of the process. I also wrote down in a document the steps involved to do it so you can take them to your machine. If you click on the pictures in the drop box you will see the pictures on the whole screen and can scroll with the arrows. Or you can right click and download them. If you would like to see how I made the buttonhole, just email me and I would do another sample with just one buttonhole. Okay, I tried again. This time I started the band on waste yarn and took it off on waste yarn and then attached it to the fabric. I decided not to cross the stitches when starting so it did not pull in. The look is different but the band lays flat. It is a little decorative but I am not totally happy with it. The second picture is the buttonhole that I love. When it comes off the machine, no loose ends or sewing to do. They come out perfect. The way to cross 8 stitches came out to be easy when I did it this way. When I wanted to cross the stitches I hand knitted the 8 stitches with ravel cord and put needles all the way out of work. I hung a small weight below the stitches and slightly pulled so all the needles came into work. I took two 4 prong tools and removed all 8 stitches. I crossed the right to the left. Then I pulled on the ravel cord end on the right and the stitches go back onto the needles on the left. Then I crossed the remaining four and put on the right needles. I pulled the ravel cord on the left and used a transfer tool to put it back on the needle. Then I continued with the next one. On the last needle you will have the ravel cord with the two ends in your hand. When you pull both ends, the stitch will appear and lift it with the transfer tool and put on last needle. Then I hand knit one row with an extra piece of yarn so it is not hard on machine to knit the next row. If anyone wants pictures of this I will gladly do over and take pictures. Just email me. I was so excited when I saw how this third buttonhole was done and I thought I would have a new favorite. My excitement was short lived. Here is a beautiful bound buttonhole . 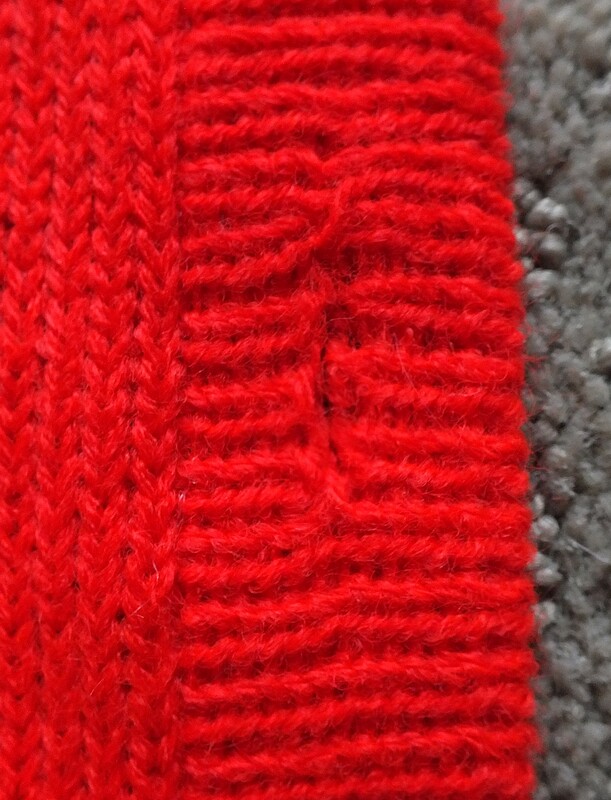 The only problem is that I don’t like bands knitted in the same direction as the garment. So, I thought let’s try it horizontally. Because of the way that the edges of the buttonholes are bound off after taking off of the machine, it can’t be done. 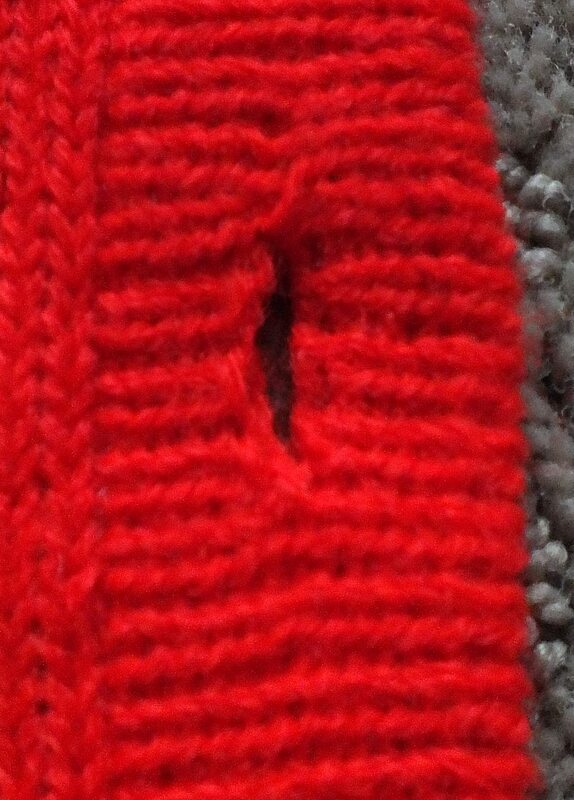 I would have to bind off one side of the buttonhole and you would get the effect of Thelm Viers and hers is easier to do on machine. I also tried to bind the one edge of buttonhole off by pulling one stitch through the other and it works but the buttonhole pulls too tight and the hole would be smaller. I followed the directions and I feel this band it too wide so I would make it less stitches. Also, it might have helped if I did a purl row on edge . I love the bound off buttonhole look though. It reminds me of the bound buttonholes I did on a lined suit in sewing class many, many years ago. This band was 25 needles and started and ended on scrap yarn. 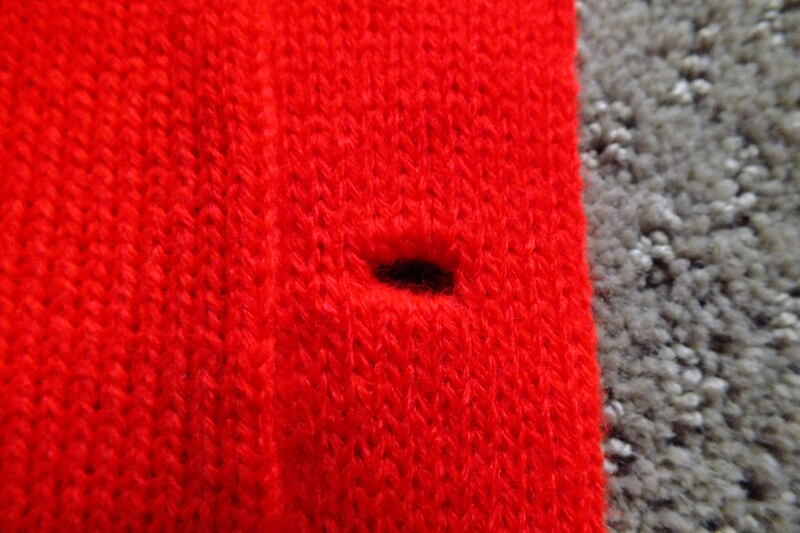 There are two sets of four needles for buttonholes on the buttonhole row. You will pull out four needles starting with the 5th needle on the right. Then skip 9 needles and pull out four needles again. Take a piece of ravel cord and hand knit just the buttonhole needles and then knit to the next buttonhole. When finished with knitting the length you want, take off on waste yarn. You will fold the band widthwise and then line up the two sets of buttonhole stitches on the waste yarn with the purl side facing you. You will hang the 4 top stitches above the ravel cord from one set and the top from the other set and bind these off. Then you take the stitches below the ravel cord and put on four needles (plus a loop to keep hole from forming) and hang the second set and bind off these four stitches. Then you pull the ravel cord out and you have a beautiful bound buttonhole. If you did it right, the hole will open with a gentle pull. I won’t go into detail but if you would like a full explanation, email me and I will send it. In conclusion, I still like Thelma Viers buttonholes. Here is the Thelma Viers buttonhole done on the passap machine. STILL MY FAVORITE! It is done on the single bed. She wrote directions for the Brother but it was actually easy on the passap. When I got to the buttonholes I just hand knitted the two rows instead of trying to do it with the carriage. These buttonholes can be done on any machine. I think they look neater even though you can see them more than KC Knits buttonholes in last posting and in the top picture of this posting. I started with waste yarn. Knit 6 rows. The next two rows I did by hand. You hand knit the stitches to the first buttonhole. Pull the stitches out all the way and bind off for buttonhole. I used four stitches. Hand knit the stitches to the next buttonhole and bind off and continue to last buttonhole and hand knit the remaining stitches. 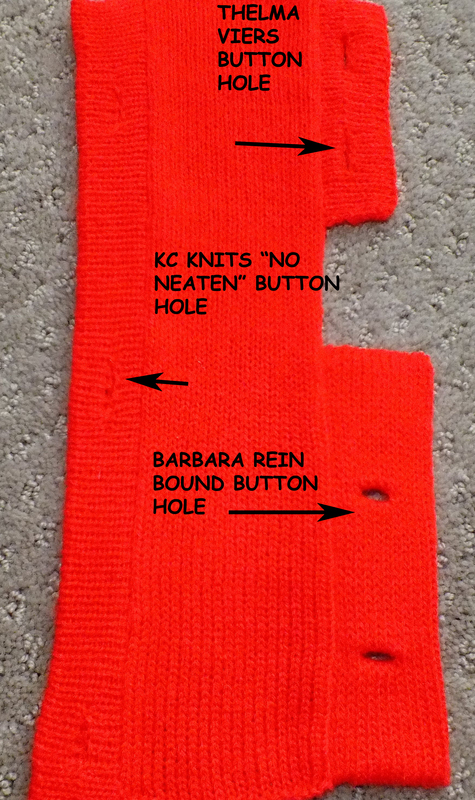 To do the next row to the right, you will hand knit the stitches to the buttonhole. E wrap these four empty needles and hand knit to the next buttonhole and do the same and continue to the end of the row. Knit 6 rows. I transferred the stitches to the front bed and did a loose row for turning row but I cut the yarn and moved carriage to the left side to knit the one row to the right . I transferred them back to the back bed and continued with the second half of the band. Knit 6 rows. Now you will do the two hand knit rows to complete the buttonhole. Hand knit the stitches to the first buttonhole. Now pick up the wrapped edge of the buttonhole in the first half of the band and hang on the four buttonhole stitches. (there will be two stitches on each needle of buttonhole) Bind these stitches off and hand knit to the next buttonhole and do the same. 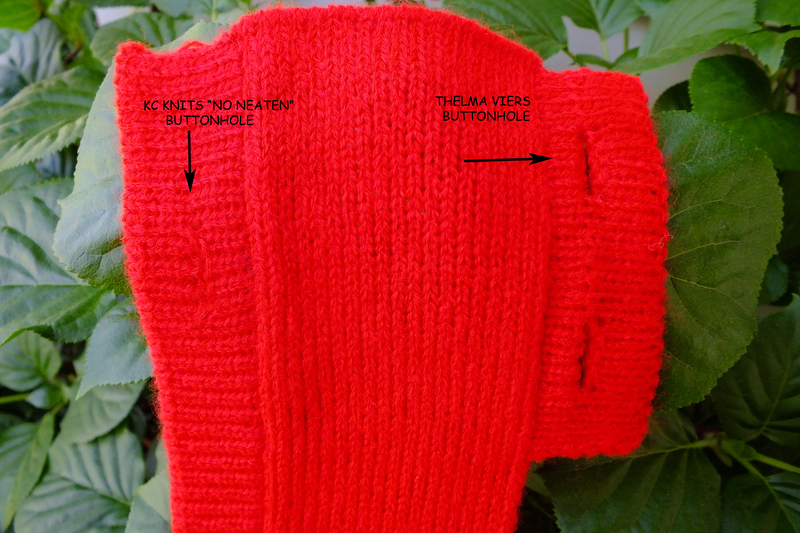 For the return row to the right, do not hand knit to the first buttonhole . Instead pick up the bound off edge of the buttonhole from the first half of the band and place these stitches on the empty buttonhole needles. Do that for each buttonhole. Also, pick up the loop to the right of each of the buttonholes from the e-wrapped row and hang on needle on right of the buttonholes (prevents a hole). Take your carriage to the left side on a free pass and then knit the row to the right. This completes the buttonhole. Check it out now to see that the buttonhole is open. Then knit the last six rows and take off on waste yarn. I hope I have not confused you. I knit these bands about one tension tighter than the garment tension. Because I put an odd number of rows to do the turn row, I cut the yarn and take carriage to the left and knit one row to the right. You must be on the right side of the needle bed when you do the hand knit rows. The ends of the bands are open but then I just use the end yarn to sew them closed. Next, I will do two more different methods on the passap for buttonholes. The instructions start with CX/CX cast on. You knit both beds CX circular until you start the buttonhole. This amount of rows would be the half of the width of your band. (This is done horizontally. You can also do this vertically) In this case it was 6 rows and then do buttonholes and finish with six rows. The handle is up by the way so stitches are opposite one another. You take four stitches for the buttonhole from the bottom bed and put on the opposite needles on the top bed. Two stitches on each needle. Now you take a piece of the same yarn and take off the four stitches on top bed with two stitches on each. That leaves 8 empty stitches on the bed-4 on top and 4 on bottom. Then it says to fill up the empty needles. You take the purl stitches from the end needles next to the empty ones and place them onto the empty needles. That fills in 4 stitches but there are 2 on the top and 2 on the bottom that are not filled. So here is the part I don’t get. I took the band off with waste yarn , each bed separately so I could attach to a side of a sweater like I did in the picture. I will next show the Thelma Viers buttonholes doing it on the passap. I know how to do it on the Brother but this will be a challenge for me. After that I will do a Betty Fergusson buttonhole for a neater finish if I can do it on the passap also.